The healthcare information systems market has progressed from being in a nascent phase in the 80s to a thriving market in recent years due to quicker adoption rates of healthcare information systems and demand for them from large as well as smaller health care organizations. Digitization of health care records has created a far more informed, innovative, and personalized care paradigm. Digitized records enable physicians to recognize warning signs for individuals who are on the edge of major health issues, thus preventing expensive treatments and hospitalizations. Health care information technology has been shown to improve the quality to care management by enhancing disease surveillance, increasing adherence to guidelines, and decreasing medication error. The global health care information systems market has expanded rapidly over the years, and there has been a noticeable rise in adoption of health care information systems in recent times. Continued increase in the cost of health care over the last few years has forced health care institutions to adopt health care IT systems in order to cut costs. About 30% of the health care costs arise due to clinical insufficiencies. The global health care information systems market was valued at US$ 227,021.4 Mn in 2017 and is anticipated to reach US$ 521,682.6 Mn in 2026. Advancements in health care information systems have led to significant expansion of the market in recent years. Use of health care information systems in medication management, electronic prescription, intelligent wearable technologies to curb lifestyle diseases, and smart robots to automate repetitive tasks is expected to significantly reduce health care costs and boost the market. In addition, rise in government initiatives and increase in health care expenditure across the world are anticipated to further propel the market during the forecast period. Governments across the world are increasing their spending to provide better health care services. For instance, an analysis based on preliminary government data by the Centers for Medicare & Medicaid Services revealed that health care spending in the U.S. increased by 5% in 2014 as compared to 3.6% in 2013. The global health care information systems market has been segmented based on application, component, deployment, end-user, and region. In terms of application, the health care information systems market has been classified into hospital information systems, pharmacy information systems, laboratory information systems, medical imaging information systems, and revenue cycle management. The hospital information systems segment has been further divided into electronic health records, electronic medical records, real-time health care, patient engagement solutions, population health management, and others. The pharmacy information systems segment has been further categorized into prescription management, automated dispensing systems, inventory management, and others. The medical imaging information systems segment has been further divided into radiology information systems (RIS), monitoring analysis software, picture archiving & communication systems (PACS), and others. Based on application, the hospital information systems segment is projected to dominate the market during the forecast period. Factors such as high adoption rate and improved efficiency are contributing to the leading position of the hospital information system segment. Based on deployment, the health care information systems market has been segmented into web based, on premise and cloud based. In terms of deployment, the web based system segment is expected to account for a prominent market share in terms of revenue due to increase in demand for easy access to data at any point of time from any device. Based on component, the health care information systems market has been segmented into software, hardware and services. Based on end user the market is segmented into hospitals, diagnostics centre, academic and research institution and others. Based on region, the global health care information systems market has been categorized into North America, Europe, Asia Pacific, Latin America, and Middle East & Africa. 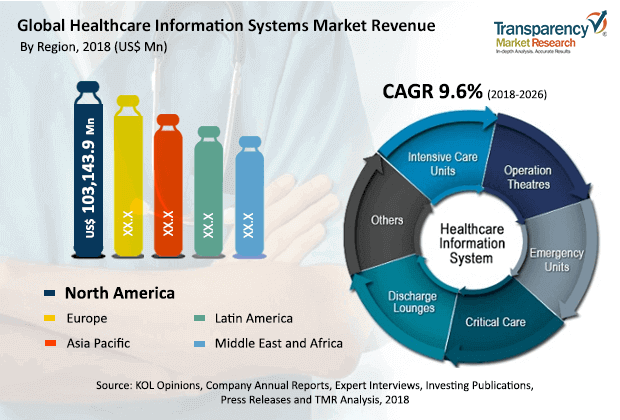 North America held a prominent market share of the global health care information systems market in terms of revenue in 2017 due to increasing government initiatives to promote usage of health care information systems and presence of a large number of prominent players in this region. For instance, The Health Information Technology for Economic and Clinical Health (HITECH) Act, enacted as part of the American Recovery and Reinvestment Act of 2009, was introduced to promote the adoption and rational use of health information technology. Moreover, many leading vendors are headquartered in North America, where they have a higher share of product sales. Emerging markets in Asia Pacific hold immense growth potential due to factors such as rising prevalence of chronic diseases, increasing government initiatives, and increase in health care infrastructure. Market players operating in the health care information systems market include McKesson Corporation, GE Healthcare, Siemens Healthineers, Epic Systems Corporation, Allscripts Health Care Solutions, Inc., athenahealth, Inc., Agfa-Gevaert N.V., Cerner Corporation, NextGen Health Care Information Systems, LLC, and Medidata Solutions, Inc. This report on the health care information systems market studies the current as well as future prospects of the global market. Stakeholders of this report include companies and intermediaries engaged in the development and commercialization of health care information systems and new entrants planning to enter the health care information systems market. This report comprises an elaborate executive summary along with a market snapshot providing overall information of various segments considered in the scope of the study. This section also provides the overall information and data analysis of the global health care information systems market with respect to the leading market segments based on application, component, deployment, end-user-, and region/sub-region. The global health care information systems market has been segmented based on application, component, deployment, end-user, and region. In terms of application, the health care information systems market has been classified into hospital information systems, pharmacy information systems, laboratory information systems, medical imaging information systems, and revenue cycle management. The hospital information systems segment has been further divided into electronic health records, electronic medical records, real-time healthcare, patient engagement solutions, population health management, and others. The pharmacy information systems segment has been further categorized into prescription management, automated dispensing systems, inventory management, and others. The medical imaging information systems segment has been further segmented into radiology information systems (RIS), monitoring analysis software, picture archiving & communication systems (PACS), and others. Each of the market segments has been extensively analyzed based on market-related factors such as rise in adoption of minimally invasive surgeries. Moreover, historical year-on-year growth has been taken into consideration while estimating the market size. The market size and forecast in terms of US$ Mn for each segment have been provided for the period from 2016 to 2026. The report also provides compound annual growth rate (CAGR %) for each market segment for the forecast period from 2018 to 2026, considering 2017 as the base year and 2016 as the historical year. The overview section of the report explores market dynamics such as drivers, restraints, and opportunities that currently have a strong impact on the health care information systems market and are likely to influence it in the near future. Market attractiveness analysis has been provided in the overview section to explain the intensity of competition across different regions. The competitive scenario among various market players is evaluated through market share analysis in the competitive landscape section of the report. All these factors are expected to help market players take strategic decisions to strengthen their positions and increase share in the global health care information systems market. Based on region, the market has be categorized into North America, Europe, Asia Pacific, Latin America, and Middle East & Africa. The market size and forecast for each of these regions/sub-regions has been provided for the period between 2016 and 2026, along with their respective CAGRs for the forecast period from 2018 to 2026, considering 2017 as the base year. A detailed qualitative analysis of factors responsible for driving and restraining the market and future opportunities have been provided in the market overview section. This section of the report also provides market attractiveness analysis, Porter’s five forces analysis, and market share analysis of key players, thus presenting a thorough analysis of the overall competitive scenario in the global health care information systems market. Major players operating in the global health care information systems market are McKesson Corporation, GE Healthcare, Siemens Healthineers, Epic Systems Corporation, Allscripts Health Care Solutions, Inc., athenahealth, Inc., Agfa-Gevaert N.V., Cerner Corporation, NextGen Health Care Information Systems, LLC, and Medidata Solutions, Inc.